There are a few variations that I want to try with this concept. 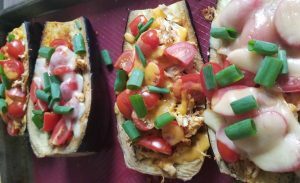 I’ve stuffed zucchini, I’ve replaced meats with sliced eggplant, and I’m sure this concept has been done before… but WOW, if I had known how easy it was to stick some food in an eggplant and make it good, I would have done it ages ago! After baking the eggplants for 20 minutes at 400F, gently press down the centers with a spoon to make a bowl. 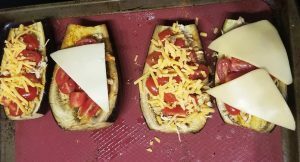 Fill and pile on previously cooked and shredded chicken (bbq seasoning or a little bbq sauce – opted for both and kept the sauce amount low as the chicken came out a little dry), diced tomatoes, and your cheese of choice. We went for cheddar, havarti, and gouda just to figure out what we like best! Bake for another 5 or so minutes and top with green onions. Enjoy!! 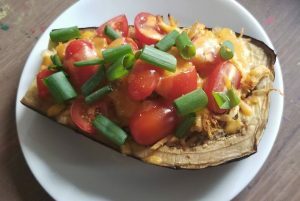 One of many variations on stuffed eggplant, you can lighten this up even further by exclusively using bbq seasoning (such as epicure's) instead of bbq sauce! 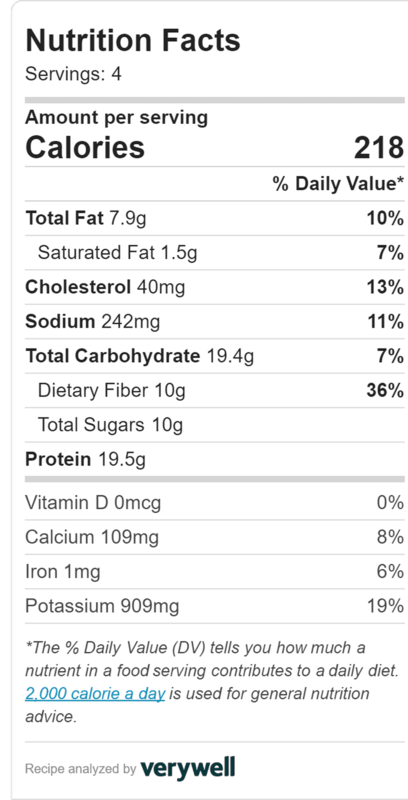 Season the shredded chicken with one tablespoon of bbq seasoning. Optionally top with bbq sauce. Preheat oven to 400F. 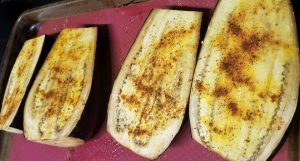 Top eggplant (face up on a baking sheet) with oil, salt, pepper, garlic powder, and remaining bbq seasoning. Bake for 20 minutes. Press down centers of the eggplant halves with a spoon to make a bowl. Fill bowls with chicken, tomatoes, and cheese (it will make a heaping pile). Bake for another 5 minutes. Top with green onions and enjoy! Will store in the fridge for a couple days.